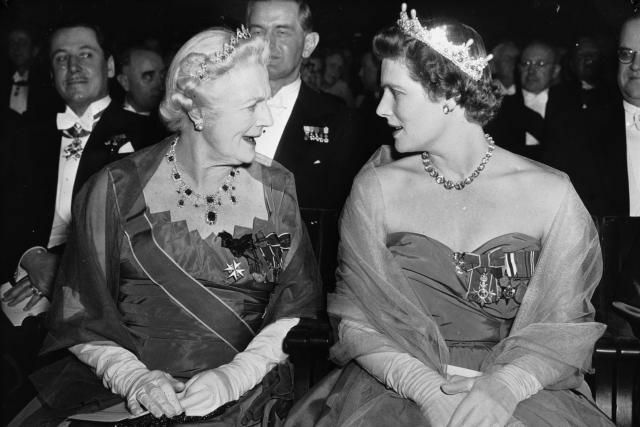 In 1953, Lady Clementine Churchill traveled to Stockholm to accept the Nobel Prize for Literature on behalf of her husband, Sir Winston Churchill. Her daughter, Mary Soames, went to the ceremonies with her. But some women have accepted the Nobel Literature Prize for their own work. Out of more than 100 Nobel Laureates awarded the Nobel Prize for Literature, fewer (by far) than half are women. They are from different cultures and wrote in quite different styles. How many do you already know? Find them in the next pages, along with a bit about their lives and, for many, links to more complete information. I've listed the earliest ones first. The Literature Prize was awarded to Swedish writer Selma Lagerlöf (1858 - 1940) "in appreciation of the lofty idealism, vivid imagination and spiritual perception that characterize her writings." Awarded the 1926 prize in 1927 (because the committee had decided in 1926 that no nomination qualified), the Nobel Prize for Literature went to Italy's Grazia Deledda (1871 - 1936) "for her idealistically inspired writings which with plastic clarity picture the life on her native island and with depth and sympathy deal with human problems in general." The Norwegian novelist Sigrid Undset (1882 - 1949) won the 1929 Nobel Prize for Literature, with the committee noting that it was given "principally for her powerful descriptions of Northern life during the Middle Ages." Pearl Buck, 1938, smiling as she learns she has won the Nobel Prize for Literature. American writer Pearl S. Buck (1892 - 1973) grew up in China, and her writing often was set in Asia. The Nobel committee awarded her the Literature Prize in 1938 "for her rich and truly epic descriptions of peasant life in China and for her biographical masterpieces. The Chilean poet Gabriela Mistral (1889 - 1957) won the 1945 Nobel Prize for Literature, the committee awarding it to her "for her lyric poetry which, inspired by powerful emotions, has made her name a symbol of the idealistic aspirations of the entire Latin American world." Nelly Sachs (1891 - 1970), a Berlin-born Jewish poet and playwright, escaped the Nazi concentration camps by going to Sweden with her mother. Selma Lagerlof was instrumental in helping them escape. She shared the 1966 Nobel Prize for Literature with Schmuel Yosef Agnon, a male poet from Israel. Sachs was honored "for her outstanding lyrical and dramatic writing, which interprets Israel's destiny with touching strength. After a 25 year gap in women winners of the Nobel Prize for Literature, the Nobel committee awarded the 1991 prize to Nadine Gordimer (1923 - ), a South African "who through her magnificent epic writing has -- in the words of Alfred Nobel -- been of very great benefit to humanity." She was a writer who often dealt with apartheid, and she actively worked in the anti-apartheid movement. The first African American woman to win the Nobel Prize for Literature, Toni Morrison (1931 - ) was honored as a writer "who in novels characterized by visionary force and poetic import, gives life to an essential aspect of American reality." Morrison's novels reflected on the life of black Americans and especially black women as outsider in an oppressive society. Polish poet Wislawa Szymborska (1923 - 2012) was awarded the Literature Nobel Prize in 1992 "for poetry that with ironic precision allows the historical and biological context to come to light in fragments of human reality." She also worked as a poetry editor and essayist. Early in life a part of the communist intellectual circle, she grew apart from the party. German-speaking Austrian playwright and novelist Elfriede Jelinek (1946 - ) won the 2004 Nobel Prize for Literature "for her musical flow of voices and counter-voices in novels and plays that with extraordinary linguistic zeal reveal the absurdity of society's clichés and their subjugating power." A feminist and communist, her critique of capitalist-patriarchal society making commodities of people and relationships led to much controversy within her own country. British writer Doris Lessing (1919 - ) was born in Iran (Persia) and lived for many years in Southern Rhodesia (now Zimbabwe). From activism she took up writing. Her novel The Golden Notebook influenced many feminists in the 1970s. The Nobel Prize committee, in awarding her the prize, called her "that epicist of the female experience, who with scepticism, fire and visionary power has subjected a divided civilisation to scrutiny." The Nobel committee awarded the 2009 Nobel Prize for Literature to Herta Müller (1953 - ) "who, with the concentration of poetry and the frankness of prose, depicts the landscape of the dispossessed." The Romanian-born poet and novelist, who wrote in German, was among those who opposed Ceauşescu. Canadian Alice Munro was awarded the 2013 Nobel Literature Prize, with the committee calling her the "master of the contemporary short story." A Belarusian writer who wrote in Russian, Alexandrovna Alexievich (1948 - ) was an investigative journalist and prose writer. The Nobel award cited her polyphonic writings, a monument to suffering and courage in our time" as the basis for the award.